There are a wide variety of dry rosés available on the market. Many entry level rosés are relatively light in style and perfect for sipping but don’t stand up well to food. Others, mainly premium rosés, are ideal food wines. When paired well with food they enhance the enjoyment and dining experience and lighten up the meal. Rosés provide flavor and acidity for pairing with food while keep alcohol levels low. This means rosé can be drunk without leaving a heavy after taste. If serving several courses, still and sparkling rosés can be served at different stages of the meal. Most roses are made to be drunk young; they’re fresh and lively with crisp acidity. The most interesting ones reveal an extra edge of complexity, balance and finesse which is derived from both terroir and winemaking. While for many years the French have appreciated the food affinities of rose wine, Americans have been put off by the false perception (thanks to Lancers, Mateus, and White Zinfandel) that all pink wines are sweet. Below, we have selected a wide variety of dishes that pair especially well with rosé and rosé sparklers. We have had many of these dishes personally at wine and food pairing events and know first-hand that they are winners with rosés. 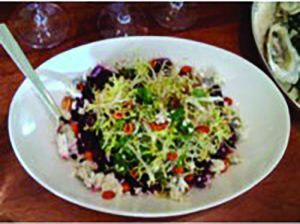 Salads and Cold Vegetables: Try rosé with roasted beet salad with goat cheese, peanuts and cherry vinaigrette or with salad Niçoise. Pair it with cold grilled vegetables such as asparagus, eggplant, corn or zucchini or mixed green salads like a Cobb salad. Rosés pair beautifully with most chicken and tuna salads. The light, crisp and refreshing rosés of Provence are wonderful accompaniments to light salads, fresh peas, or potato salad with bacon and soft boiled eggs, shrimp, avocado and roasted corn salad. Make sure that the acid level in the salad is less than the acid in the wine. To be sure, choose roses with high acidity and take into account the flavors of vinaigrettes for salads. A prorportion of four parts olive oil to one part vinegar works well. Appetizers: Rosés pair well with watermelon, feta and mint. They are magnificent with crispy hors d’oeuvres with spicy sauces, bruscehetta , and pissaladière. The latter, a flat bread of onions, olives. anchovies and thyme is served as a snack or as a meal. Asparagus, crispy prosciutto and brie grilled cheese also pair well with a wide variety of rosés. 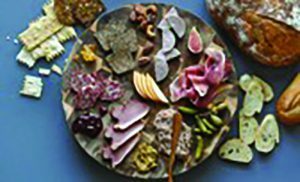 Charcuterie: Cold meats and especially cold cuts such as those pictured here from D’Artagnan tend to have both the saltiness and spice to enhance the flavors of rosé wines. The wines not only hold up to them but reveal more of the salami’s umami or savory character. Fish and Seafood: Dishes from anchovies to grilled tuna, grilled shrimp and poached cold or even grilled salmon work extremely well with the more full-bodied and creamy textured rosé wines, especially if accompanied by an aioli or other mayonnaise based sauces. 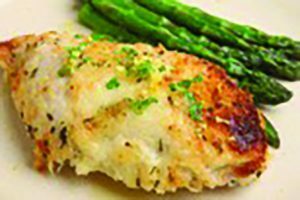 Try rosé with fish or seafood stew, crab cakes, fish and chips, fried oysters, roasted black sea bass, and seared rainbow trout. Try smoked salmon with a rosé sparkling wine or rosé Champagne. Provençal roses generally pair well with bouillabaisse and aoli (fish soup with garlic mayonnaise). Provence rosés also pair well with a delicate white fleshed fish. Chicken and Duck: Grilled chicken breasts pair beautifully with rosés. If you can’t travel to Morocco or Spain, try rosé with chicken tagine and couscous, chicken in garlic sauce, chicken empanadas, or even chicken chilindron, a fabulous chicken dish served with green and red peppers, ham, and savory spices. Muscovy duck breast pairs beautifully with Pinot Noir based rosés. Pork: Grilled spicy sausages have a natural affinity to rosé as does baked ham. And marinated pork loin tenderloin is a winner with rosé as is roast veal. Try a bold flavored Tavel with these dishes. 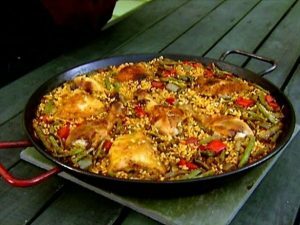 Paella and Rice Dishes: What could be more perfect than a rosé with paella? 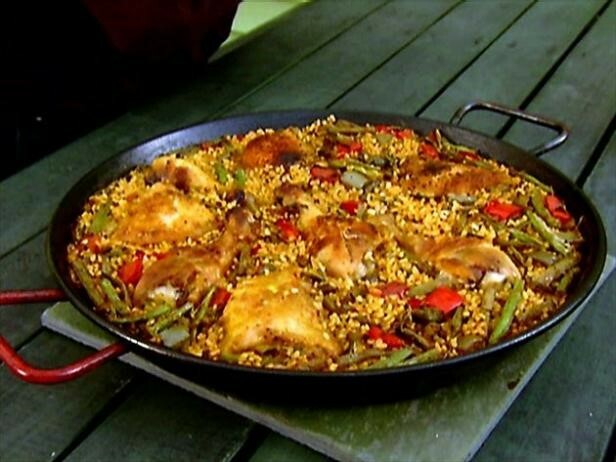 Vegetable, seafood and Valenciana paella all show well with a Grenache based rose from Navarra or the South of France. Grenache rosé works beautifully with saffron and tarragon. Light Pasta: Try rosé with pates au pistou (pasta with basil pesto). Italian rosés made of Sangiovese are a natural partner with this light pasta. Spicy Foods: Spicy foods such as Indian curries and Thai dishes that feature piquillos or peppers have a natural affinity with these wines. You might even enjoy one with more mundane but tasty dishes such as a grilled sausage and peppers, hamburger, hoagie or a Philly cheese steak sandwich. Tavel and the more boldly flavored, high acid wines of Provence pair nicely with these dishes. Cheeses: Cheese can be challenging to wines, usually overwhelming their character, but some rosés hold up very well to a number of cheeses. Try rosé with smoked gouda and mushroom quesadillas. Semi-soft cheeses like gruyere, Havarti and Monterey Jack go well with dry rosé. Try a tangy and earthy Roncal or Idiazabal, a Zamorano or Majorero sheep’s cheese, and finally try one of the many Cabrales blue cheeses now available in the US with a refreshing strawberry-scented dry rosé. Desserts: Especially good with sparkling rosés and some rosé Champagnes are apple or cherry pie, berry fruit tarts, fruit puddings, dark chocolate truffles and strawberry cheesecake.